Prolidase [EC.3.4.13.9] is a cytosolic imidodipeptidase, which specifically splits imidodipeptides with C-terminal proline or hydroxyproline. The enzyme plays an important role in the recycling of proline from imidodipeptides (mostly derived from degradation products of collagen) for resynthesis of collagen and other proline-containing proteins. The enzyme activity is up-regulated by β1-integrin receptor stimulation. The increase in the enzyme activity is due to its phosphorylation on serine/threonine residues. Collagen is not only structural component of extracellular matrix. It has been recognized as a ligand for integrin receptors, which play an important role in signaling that regulate ion transport, lipid metabolism, kinase activation and gene expression. Therefore, changes in the quantity, structure and distribution of collagens in tissues may affect cell signaling, metabolism and function. 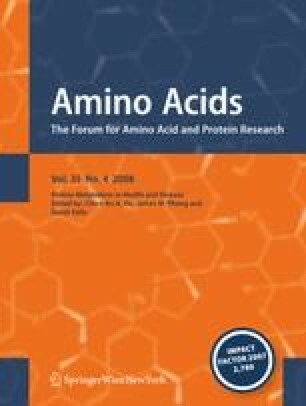 Several line of evidence suggests that prolidase activity may be a step-limiting factor in the regulation of collagen biosynthesis. It has been shown in different physiologic and pathologic conditions. It is of great importance during wound healing, inflammation, aging, tissue fibrosis and possibly skeletal abnormalities seen in Osteogenesis Imperfecta. The mechanism of prolidase-dependent regulation of collagen biosynthesis was found at both transcriptional and post-transcriptional levels. In this study, we provide evidence for prolidase-dependent transcriptional regulation of collagen biosynthesis. The mechanism was found at the level of NF-kB, known inhibitor of type I collagen gene expression. Modulation of integrin-dependent signaling by stimulatory (i.e. thrombin) or inhibitory (i.e. echistatin) β1-integrin ligands or by nitric oxide donors (i.e. DETA/NO) affect prolidase at post-transcriptional level. All those factors may represent novel approach to pharmacotherapy of connective tissue disorders.